AUGUSTA -- People of many faiths marched to Capitol Park Sunday to show support for the Occupy Augusta encampment on the eve of a court hearing to determine whether the group can continue to live in the park. AUGUSTA — People of many faiths marched to Capitol Park Sunday to show support for the Occupy Augusta encampment on the eve of a court hearing to determine whether the group can continue to live in the park. About 50 people walked from the Unitarian Universalist Community Church down State Street to Capitol Park. They sang songs and talked about the economic injustice that has driven thousands of people across the country to take up residence in parks and other public spaces as part of the Occupy movement. 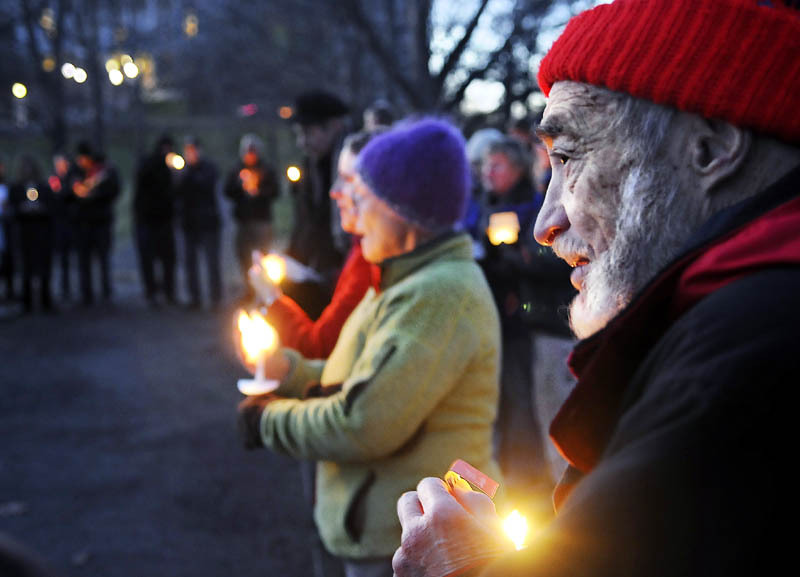 Those offering a show of support in Augusta included Quakers, Universalists, Catholics, Jews and Buddists. And while Sunday’s event was peaceful, Capitol Police on Saturday issued a summons to Jarody, 27, of Augusta, on a charge of criminal threatening. Jarody, who uses only one name and has been a candidate for city council, is accused of threatening a man with a sledgehammer at the Occupy site on Thursday. Last week, nine people affiliated with the Occupy Augusta movement were arrested when they refused to leave the grounds of the Blaine House. And today, a U.S. District Court judge in Bangor will consider a request from Occupy Augusta to be allowed to continue to live indefinitely in the park without a permit. Capitol Police allowed the group to live in the park since Oct. 15 without a permit, but now believe the group is causing damage to the ground at the park, and that there has been little protest activity at the site. Two of those arrested have sued the state to argue that filling out a permit violates their First Amendment right to free speech. Demi Colby, one of the roughly 15 people who have lived at the site, said she’s not worried about today’s hearing. Sunday’s event was organized by the Rev. Carie Johnsen of the Universalist church in Augusta. Rabbi Susan Bulba Carvutto of Temple Beth-El in Augusta said the Torah teaches the importance of economic justice. “I’m grateful to the Occupiers for bringing this issue forward,” she said. As the ceremony ended, the group lit small white candles while they sang a final song. One of the Occupiers thanked the group for showing support — and participating in a little civil disobedience by having an open flame on the grounds. Part of the agreement that allows the group to stay in Capitol Park, at least until today’s court date, states that they will have no fires. Colby said the group was grateful for the show of support. “To me personally, being very spiritual, it meant a lot,” she said.